Asturias is one of the 17 autonomous regions in Spain. It can be found in the northwest of the country on the coast of the Bay of Biskay (or Cantabrian Sea). This part of Norh of Spain, between Galicia and Santander, is a land of mountains, beaches, food and landscapes. Besides this you can be asthonised with Picos de Europa, Covadonga, Llanes, Gijón, Oviedo and Avilés. This last city appears now in maps of culture with the Niemeyer Centre. 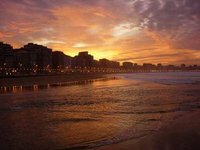 The capital is Oviedo, and together with the nearby city of Gijón the most important cities in the region. The region of Asturias is what is left of the once mighty Kingdom of Asturias, that in the middle ages covered most of the northwest of Spain, and north of Portugal. Asturias borders to the north on the Bay of Biskay, to the west lies Galicia, in the south Castile and León, and to the east it borders on Cantabria. The southern border follows the peaks of the Cantabrian mountains, of which the Picos de Europa, in the east at the border with Cantabria are the highest. 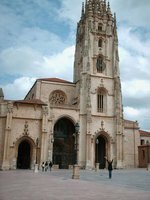 Oviedo, with monuments on the Unesco World Heritage List. The coast has some nice places to visit like Llanes. Locally produced Sidra (cider) as the temperate oceanic climate allows for fruits such as apples to be grown. It's purely apples and in any bar or restaurant they'll pour from a great height and you're expected to down it in one (these are long standing traditions). Parque Natural de Somiedo, this natural park in the heart of the Cantabrian mountains is home to several endangered species such as the Cantabrian Capercaillie and Cantabrian brown bear. There are many different paths along the mountainsides, along rivers and cycle routes too. The weather in the north of Spain is different from that of the rest of Spain. The region is sometimes referred to as the Costa Verde (the green coast) for a good reason. It has a mild humid climate that is influenced a lot by the ocean. Temperatures a much lower than in other parts of Spain, and rain is a common here, as it is in England. The northside of the mountains see more rainfall than the southside, and with Asturias lying on the northside of the main ridge, it means that it is always a good thing to pack your umbrella when you are travelling here. Still, inland temperatures in summer are mostly between 25 °C and 30 °C and winters are mild with around 10 °C or more. About 45 kilometres to the northwest of Oviedo, and 40 kilometres west of Gijón lies the Asturias Airport (OVD). Iberia/Air Nostrum carries out flights within Spain: Madrid, Barcelona, Alicante, Málaga, Seville and Valencia, and two destinations within Europe: Brussels and Lisbon. Besides Iberia, also Easyjet, Vueling, Air Europa, Air France and Air Berlin use this airport. Most of the flights stay within Spain, but there are also connections to London, Geneva and Paris. There are train connections to the neighbouring regions, but also a direct connection with Madrid. For more information and timetables, check the website of Renfe. The main road in Cantabria is the coastal highway, A-8 that runs from Bilbao in Basque Country to Gijon and beyond. When coming from the south (Madrid) taking the A-6 and switch to the the A-68, near León is the best option. In the middle of Asturias there are a couple of highways connecting the bigger places with eachother. From Oviedo to Gijón you can follow the A-66, until it connects to the A-8 not that far from Gijón. When driving into the mountains in the winter, it is more than advisable to have snow chains with you. This is version 19. Last edited at 12:27 on Jun 24, 13 by Sander. 18 articles link to this page.